There is so much constantly going on in The Japan Foundation Toronto that when I first wrote this post trying to enlist everything we’ve done in the last two months, it ended up as a list of all the exhibits, lectures, screenings and talks. And because a list is not necessarily the most exciting form of narrative (with which Umberto Eco could disagree – see his The Infinity of Lists: The Infinity of Lists by Umberto Eco | Book review | Books | The Guardian ), I had to start the post all over again. This time I decided to choose an event in which I personally participated, so I could provide a first-hand report. 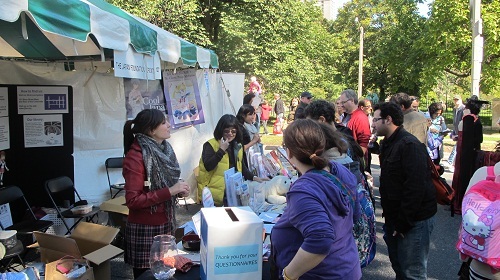 As a Library Assistant I am not directly involved in most of the activities outside of the library, so let me tell you about one occasion at the end of September when I went to represent the Japan Foundation Toronto beyond the office walls. 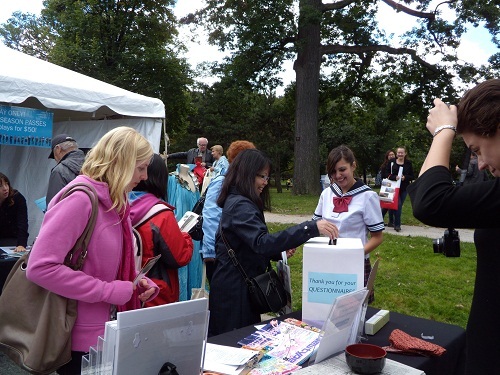 On the 23rd of September The Japan Foundation Toronto took part in the Word on the Street: National Book and Magazine Festival ( Toronto | The Word On The Street). 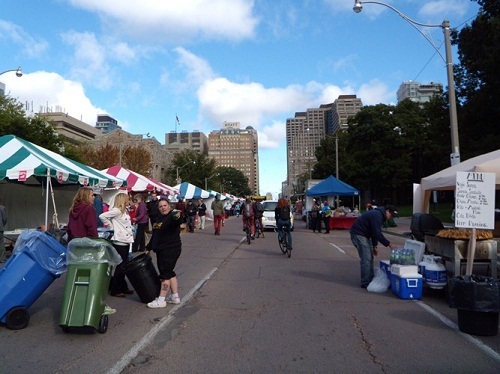 The beauty of this annual event is that it is held outdoors, on the street around the big Queen’s Park in the heart of the University of Toronto downtown campus. The whole street is closed to traffic and occupied with booths by publishers, authors, or cultural organizations, with thousands of visitors strolling among them, checking out the latest books, meeting the writers, learning about new cultural places in town. 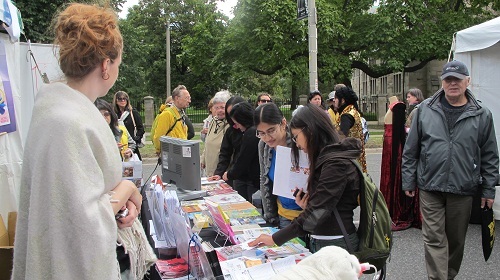 Every organization tries its best to attract people to their tents, be it for example by offering hands-on experience, like our neighbor, The Nightwood Theatre, where visitors could try on actual costumes from their shows, or by featuring well-known persons, like the city’s biggest newspaper, Toronto Star, which organized panels with famous authors and intellectuals. We talked to people who had been to Japan and were happy to share similar experience with our staff. We met youth passionate about manga and anime who were pleasantly surprised to discover that we carried over 2200 volumes of manga in our library. 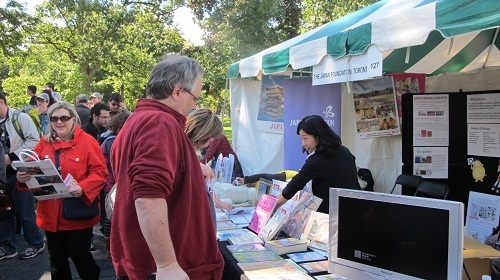 Yet other guests used the opportunity to practice their Japanese language skills on us, and we used it to invite them to attend our language workshops or come to the library and browse our extensive collection of Japanese language materials – both in English and in Japanese. A little TV in the corner of the table drew people’s attention to CD promotion music videos and was a good conversation starter to introduce our DVD collection or invite them to animation and movie screenings which we hold quite often. We met some of our patrons, but also a lot of people who’ve never been to our center. From the questionnaires collected at the event (and everyone who filled one out could draw a prize, so we got quite many: 225 from an estimated 2065 people who came to or passed by our booth) we found out that 64% of the respondents have never been to the Japan Foundation Toronto, so we consider the event a success in spreading the word about the organization. 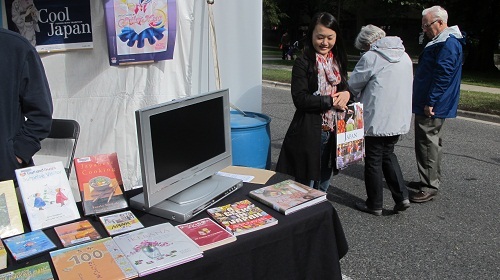 Participating in shows and festivals is an effective way to raise awareness about the Japan Foundation Toronto and its activities, and this is why we often get involved in such undertakings. Another large-scale event where the Japan Foundation Toronto was present was The Fan Expo Canada (Fan Expo Canada - August 23-26, 2012) at the end of August 2012, and in the meantime we’ve been showing up at many smaller events featuring Japan, like the University of Toronto’s Japan Day in November, or a large bank’s multicultural day last summer, where we represented Japan. Setting up a booth and spending a day or even the whole weekend at an event is a lot of work, but I believe that face-to-face contact with our existing and potential patrons allows us to present the Foundation as an organization with a human face, and to express personal commitment of its staff and volunteers. And speaking of volunteers, I would like to thank everyone who helped us at the Word on the Street and every other awesome person out of over 200 volunteers who are working with us right now. We would not be able to do all these things without you. Domo arigato! Early morning preparations for the festival. We installed our booth in one of the tents like these. The library staff member Ayumi, holding the Japan paper bags. 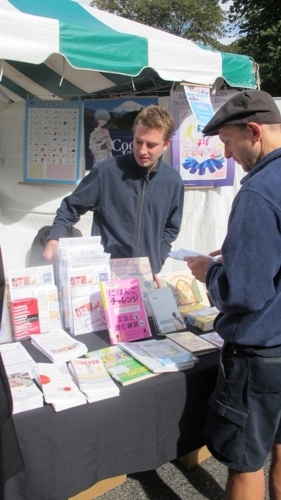 The volunteer Jesse, showing the display materials and flyers to a visitor. The volunteer Maria, receiving a filled out questionnaire from a visitor, bravely enduring the early autumn chill in a Japanese high school uniform. The costume was a part of our attention-catching tactics and we are really grateful to the volunteers that they agreed to wear them. Really. Another volunteer, Helen (on the right) was also kind enough to dress up for the event. Here posing with the Chief Librarian Mariko Liliefeldt in the middle and Sachi, the library staff member who got a fancy to try a uniform herself too. 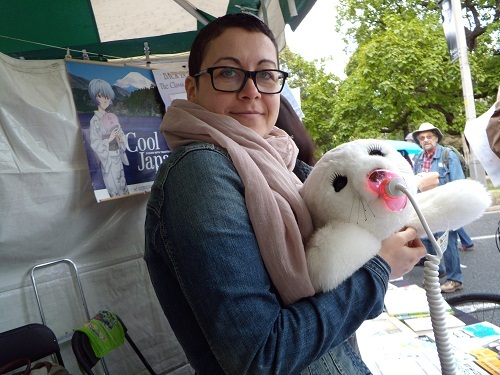 The volunteer Danielle is holding Paro-chan, at the moment “feeding” on electricity through its cute pink pacifier. Danielle genuinely loves Paro and for this reason it’s usually her who takes care of him. When it’s not Danielle, the Program Officer Kate looks after the baby seal robot. In her left hand you can see a clicker counter – this is how we counted the attendance. 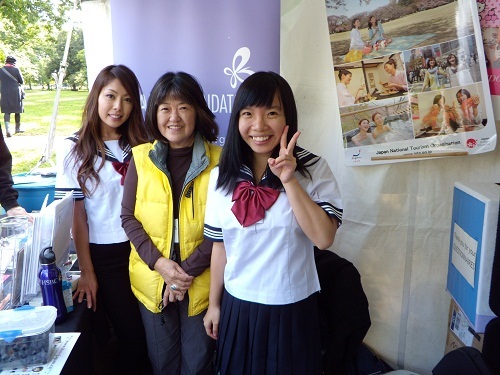 The Administrative Assistant Hisayo is talking to visitors. The lady in red is apparently happy with the paper bag and one of our promo materials. Here again Maria, Hisayo and Mariko keeping an eye on the baby seal, Paro-chan.